Most of our food would not fit on my table because it is small. The menfolk like to watch the game while they eat, and Karen and I sat with the children in the dining room. Everyone enjoyed everything, but took dessert home as they were stuffed. I could not find any sectional plates with a fall theme . . . but the children liked the Christmas plates, and turkey napkins. 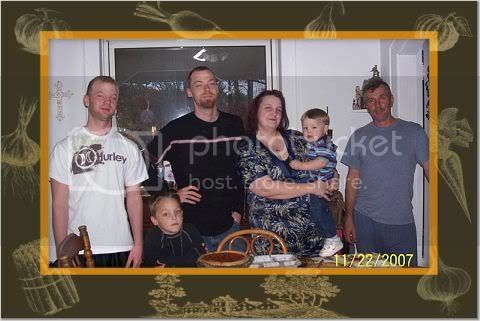 L to R . . . David, Erik, Adam, Karen & Tyler, and my fiance' Robb. Our friend from SC did not come until Saturday so he got leftovers today, after he and Robb cut two good loads of wood. What a great family piccie - only one thing wrong - you weren't in it!! You certainly put on a great spread for your family and those sectional plates are a brilliant idea. A feast fit for a king! Looks like Erik kept a good eye on that pie! 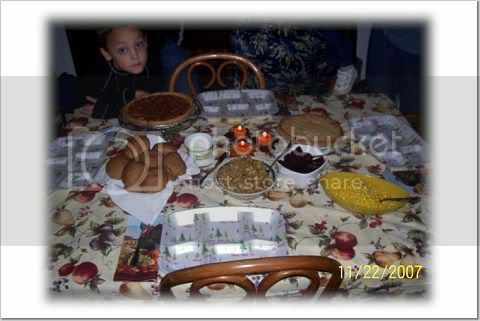 My son would be hovering over the pie too!